and some very tight pants and loudly patterned shirts. If you don’t care for soap operas then you needn’t read further. You won’t like Adhikar. If you do sneak peeks at soaps on sick days and holidays…read on! But be warned: I can’t do this justice without a verrrrry long narrative and many many screen shots. Barrister Shukla (Ashok Kumar) is delighted to discover that his old friend Shivcharan Sharma (Raj Mehra) has moved to Bombay with his family. They are old friends, and Sharma has a beautiful daughter, Mira (Nanda), whom Shukla feels would be a perfect match for his nephew Shyam (Deb Mukherjee). She is appropriately shy at the thought. Shyam meanwhile is hanging out with his posse at what looks suspiciously like the Sun ‘N’ Sands hotel on Juhu Beach, looking for some mischief. 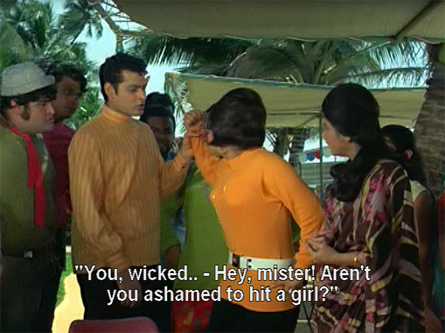 He finds it when some girls dressed in pants (and therefore clearly up to no good) appear to harass a couple of girls in saris (clearly in need of rescuing). Lost Opportunity #1: After chasing away the girls in pants, he introduces himself to Radha (Nazima) and there is clearly a spark between them. But he doesn’t ask her anything other than her name and they say goodbye. When he gets home, his uncle tells him to go visit Mr. Sharma and his daughter—his cousin-sister Rekha (Tabassum) tells him that’s he’s being sent to approve of his future bride. Off he goes obediently—only to meet that the same Radha at the door! Coincidence #1: Radha is working at the Sharmas as a nursemaid and companion to bedridden Mrs. Sharma at the recommendation of her physician, Dr. Kailash (Shivraj). 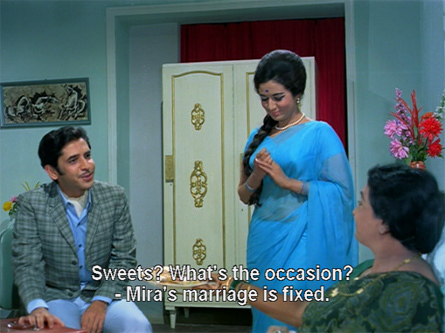 Big Misunderstanding #1: Shyam thinks that she is Mr. Sharma’s daughter and his intended bride, and he’s very happy. Radha has no clue about this angle to things, and she falls in love with him. Bad Decision #1: Shyam romances her and then seduces her after declaring before a shrine that he will marry her. The next day he goes off to spend a few months in England, but first he calls Radha to say goodbye. Big Misunderstanding #2: Mira answers the phone. Shyam fails to realize that she isn’t Radha and he promises to come back and marry her. Mira assumes that he has accepted her father’s proposal. When he also apologizes for his behavior the day before she thinks he is apologizing for missing dinner with the family, to which he had been invited but didn’t show up for (because he was very busy elsewhere). Meanwhile, Radha’s hag of a stepmother is promising to marry her to a sleazy guy named Shankar in exchange for his gifts of money. She is upset when Radha returns home very late from her tryst, and forbids her from going to work at the Sharmas again. 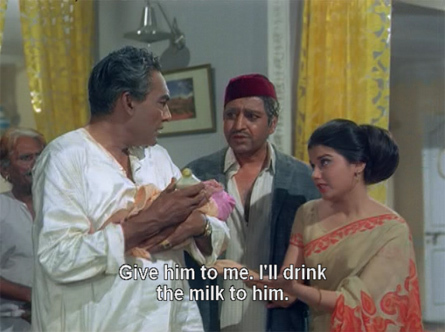 When Radha discovers that she is pregnant, her father and stepmother throw her out, and nobody wants anything to do with her. She goes to her friend Dr. Kailash and confides in him. He takes her in, saying she can work at his clinic until she has the baby. Radha receives a letter from Shyam (brought to her by one of the Sharmas’ servants) telling her that he loves her and will marry her on his return from England. 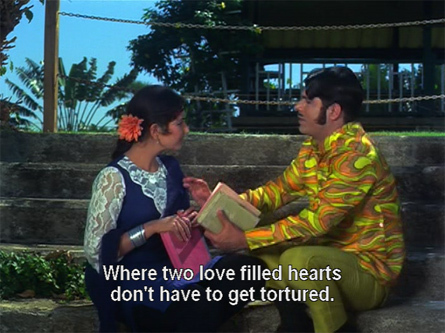 Unnecessary Side Plot #1: Shyam’s sister Rekha meanwhile is being romanced by a guy named Deepak with a fondness for psychedelic shirts and tight pants. This is a track that never goes anywhere, and could have been cut out—although Deepak’s fashion choices are almost worth the extra minutes it adds to the film. Lost Opportunity #2: Dr. Kailash is in love with Mira but too shy to say so. When he finally works up the courage to propose marriage, he discovers that he is too late and she is promised to Shukla’s son Shyam. 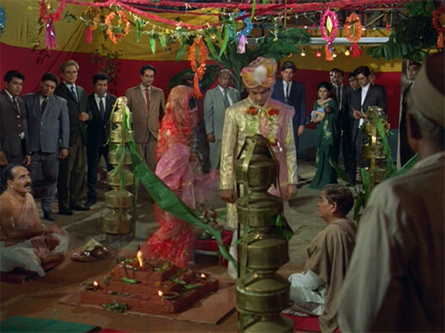 When Shyam returns from England he goes directly to the Sharmas to see Radha. When he is introduced to Mira, he is surprised. Mira knows that something is wrong, but her father takes Shyam upstairs to meet her mother. Lost Opportunity #3: Dr. Kailash is there with Mrs. Sharma but of course neither of them knows that the other one knows Radha. Shyam is distraught and leaves the Sharmas to look for Radha but can’t find her and really has no idea where to even look. Coincidence #2: He happens to ask—of all people—former suitor Shankar if he knows Radha or where she lives. Shankar tells Shyam that Radha was an immoral woman and was run out of the neighborhood. 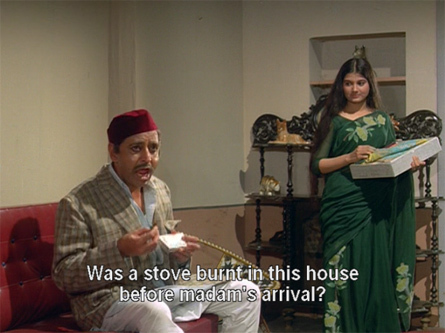 He gives Shyam directions to Radha’s house, where her stepmother confirms what Shankar has said. Lost Opportunity #4: The next time they meet, Mira asks Shyam if he is in love with someone else. She says that she will refuse the marriage if he is. He thinks she is really sweet and remembers the criticism of Radha’s character, and his uncle’s enthusiasm for the marriage to Mira. Bad Decision #2: He agrees to marry Mira and tells her that he doesn’t love anyone else. At the clinic, Radha gives birth to a baby boy. Dr. Kailash stops by to see her and mentions that he’s going to Mira’s wedding. He gives the invitation to Radha for her to look at and goes off. When Radha sees the groom’s name, she freaks. Lost Opportunity #5: She finds a cab and urges the driver to hurry to the Sharmas so that she can stop the wedding—but arrives just as Mira and Shyam are taking the final steps around the fire. Bad Decision #3: She leaves the baby in Mira’s room with a note explaining everything. To prove the truth of her story, she writes the note on the other side of the letter that Shyam had sent her from England. She says that since Mira has taken her place in Shyam’s life, she should also take the baby and bring it up as her own. Bad Decision #4: Mira reads the note and decides that it is her duty to reunite Radha with Shyam and the baby. 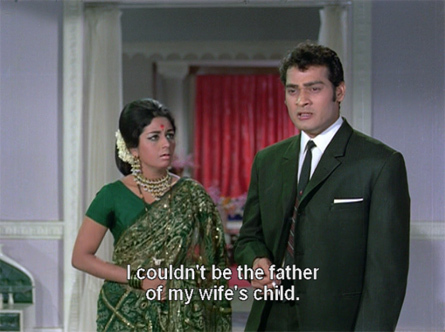 To that end, she tells Shyam that she has a child out of wedlock. Needless to say, he is upset and leaves her to a lonely nuptial bed. As Shyam continues to shun his new bride, she settles in at his house. Shukla thinks Mira is wonderful and when he sees her crying asks what is wrong. She tells him that she had a friend who had a baby and died—leaving the baby with her. She doesn’t know what to do with it. He tells her to bring the child home. 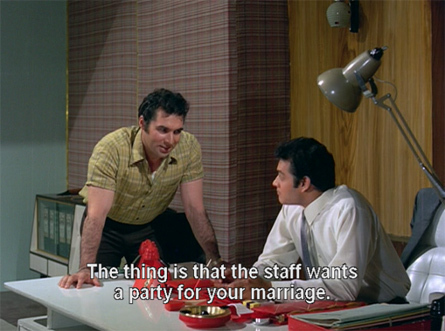 Unnecessary Side Plot #2: Shyam’s cousin Rajan is jealous of Shyam’s elevated status (Shukla clearly prefers him over Rajan). Rajan is making a good living as a forger in addition to working at the family’s company. This side plot gains some usefulness towards the end of the film, but an awful lot of time is wasted on it nonetheless. Shukla is happy to play grandfather to the baby; but Shyam is shocked when he comes home and finds the baby in residence, and hears the story Mira has told his uncle. Lost Opportunity #6/Coincidence #3: Just as Shyam is about to tell his uncle what Mira had told him, the phone rings. It’s Shukla’s cardiologist. He tells Shyam that his uncle’s heart condition is bad and he should not be given any surprises or distressing news. Shyam confronts Mira and asks her angrily why she didn’t tell her father the true story. Mira says that it was out of respect for Shukla, and that Shyam should learn to forgive those who make mistakes. He doesn’t seem to get it. I don’t like him nearly as much as I did in Ansoo Ban Gaye Phool. Back in poor Radha’s life, things are looking up. After leaving the baby at Mira’s, she had wandered in the rain, considered suicide, was nearly molested by some loafers and finally was rescued by a hunter from Bhopal named Banne Khan Bhopali (Pran). Coincidence #4: Banne Khan is a good friend of Shukla’s. 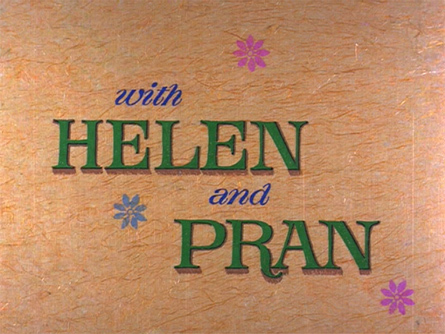 He’s been in the film from the beginning as a Somewhat Unnecessary Side Plot (although an argument could easily be made that Pran is NEVER unnecessary); going forward now, though, he has more of a purpose. Banne Khan has taken Radha home to live with him and adopted her as his sister. She tells him that she needs something to do with her time, a job; and he promises to get one for her. Coincidence #5: The next day he takes her to meet his friend Shukla. They arrive just as Mira is leaving and Radha realizes whose house it is. She’s amazed at the coincidence (clearly she hasn’t been paying attention) but overjoyed to see her baby in Shukla’s arms. Banne Khan asks Shukla if he can provide Radha with a job and Shukla says she can work at the company office. Hearing this, Radha prepares herself for a confrontation with Shyam. Lost Opportunity #7: It doesn’t go well. Recriminations fly on both sides, and Radha tells him to forget his child and to forget her, and storms out. Bad Decision #5: She decides to keep the job however, not knowing what she would give as an excuse to Banne Khan, and also hoping that she can see her son now and again. She vows not to have an affair with Shyam, though, saying that Mira is a goddess for accepting her child into her home. Mira is continuing to endear herself to all at home too (except Shyam of course). She finds out about Rekha’s feelings for Deepak and arranges their engagement. 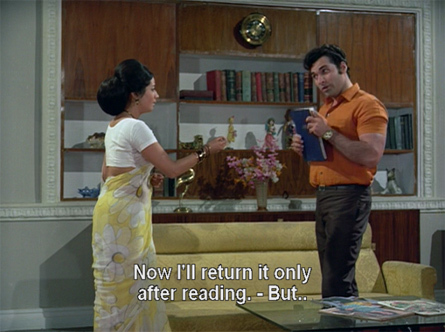 Evil cousin Rajan comes to the house and picks up the notebook that Mira writes her poetry in. Bad Decision #6: She lets him take it home. At this juncture I realize two things: one, there is still an hour left to go in the film and two, I am exhausted—although engaged—by all the plot points. Anyway, a party is given to celebrate the child’s first birthday. Shyam is tired of being told by one and all that his wife is a goddess when he thinks he knows her true nature. This party is the last straw. He picks a fight with Mira which is overheard by Rajan, who is positively gleeful when he hears that Mira is the mother of the baby. The next day, Radha is called into Shyam’s office. Alas, he is not there, but Rajan is. but she fights him off with an ashtray, and then a chair which she throws through Shyam’s office window into the main office. Bad Decision #8: Even though everyone in the office can now see what’s going on, Rajan continues his assault. 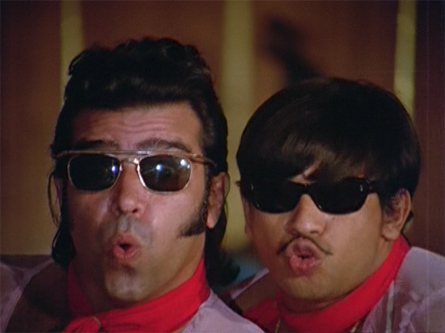 After the other office workers rescue Radha, they call Banne Khan, Shukla and Shyam to the office. 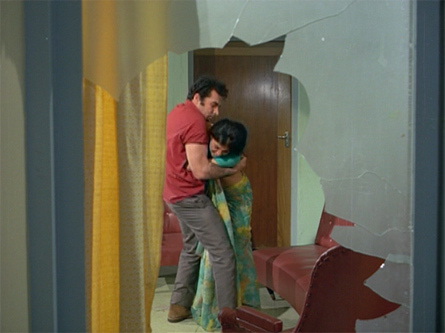 Rajan gets a thrashing from Banne Khan and is thrown out of the office, vowing revenge as he goes. Back at home, Deepak’s parents arrive to talk with Shukla about breaking the engagement with Rekha. They tell him they have heard a rumor that Mira is the baby’s real mother. He calms them down and refuses to listen to such nonsense. 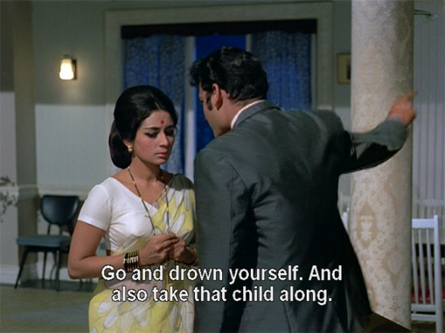 Shyam though wants to take the baby to an orphanage, and he and Shukla have an argument which ends with Shukla reminding Shyam that he too is an orphan. Shyam heads for a bar to get drunk and I perk up. This can only mean one thing! Shyam gets good and sozzled while Rajan looks on and gloats. Clearly all these Lost Opportunities, Coincidences and Bad Decisions are leading to Trouble Ahead. Will Shyam ever get a clue? Will Rajan use his forgery skills and Mira’s notebook to bring disgrace on the family? Will Radha die like most fallen women in Hindi films before her? Will any of them ever be happy again? Posted on February 12, 2008 at 11:13 am in Hindi movies	| RSS feed You can skip to the end and leave a reply. Wow that sounds like a marathon. I like the way you’ve divided the story line into lost opportunities, bad decisions, coincidences and unecessary side plots. I should perhaps analyse my life with those headings in mind. Fun review, keep it up! Great review! 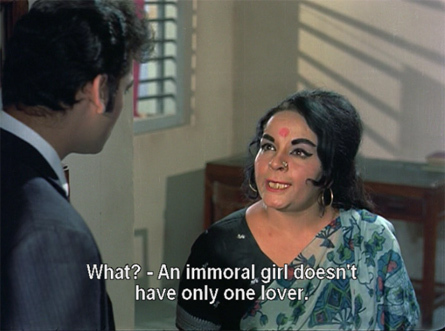 I loved this movie, but I love just about anything with Deb Mukherjee in it. I thought that the Shyam character was much like a character Ashok would play–a bit of a jerk, the kind of person you want to grab hold of and give a good shake. I loved Deb Mukherjee in Ansoo Ban Gaye Phool and everyone thought I was nuts :-) I guess you and I are his major fans, Aimee! But he was such a jerk in this movie, I wanted to kick him. This movie may be a big flop, but its songs are absolutely top class. Its songs are all gems. Film: Tu Hi Meri Zindagi Cast: Deb Mukherjee, Salomi, Nivedita. do Know about the movie though. That should read – Do Not know about the movie. So you were on a mission to discover Deb Mukherji ! I recommend “Sambandh”(1969). I think that this is the best role he played in a Bollywood movie. I watched this movie recently and I liked it. But that was mainly because I watched the movie without any great expectations to begin with. The fact that this movie was based on a novel meant that the movie had a proper story line. And I was highly impressed with the music of O P Nayyar ( very un O P Nayyar kind of music too). Here he teamed up with lyricist Pradeep for the first time.It was perhaps for the first time in his career that he used the voices of Mukesh and Hemant Kumar in a movie, and both these singers delivered with a few wonderful songs. I just read about Sambandh somewhere, how funny that you should bring it up. Guess I need to look for it now! :-) And yes, the songs in this are very nice indeed. You may have read about “Sambandh” in my blog. I posted a song from this movie yesterday and one song today. Came upon this description by chance because I love ‘koi jaane ya na jaane’ and was looking for the story. This is the funniest thing I’ve ever read. I was laughing so much that my came rushing to see what had happened!!! Great stuff. Now to explore your other work!!! Sorry, the song is ” Koi maane yaa na maane jo kal thak they anjaane woh aaj…” not Koi jane ya naa jaane..
@Memsaab, thanks for the review. Stumbled upon this page accidentally and it took me to a long trip down memory lane. I’d watched this movie way back on Doordarshan during the black and white TV era. Those days, the Sunday movie was a social ritual where everyone from the house-help, neighborhood kids and their families would dutifully take their place in front of the TV and one could hear collective sighs of disappointment when marathon movies like this one were interrupted by the night news. Often the climax or any song that fell after the news would be cut short. In spite of so many causes for complaint, there were several shining moments (with tears) in this film, not to mention the songs. Tabassum used to do a film based talk show back then and it was interesting to see her in a minor role. BTW did anyone find out what happened to Nazima? Sorry if this seems long. Thanks for your comment (never too long!) and sharing your memories :) I haven’t been able to find out anything about Nazima, but would love to! Sorry about asking this, but what’s the name of the villain in this movie? He’s the same guy who starred in ‘Caravan’ (1971) as well. Don’t know why he was not cast in many movies after that. His name is Kishan Mehta :) I think he’s been in quite a few movies, I’ve seen him a lot. Kishan Mehta …. Memsab thanks for this information. Don’t know why he didn’t continue in movies. 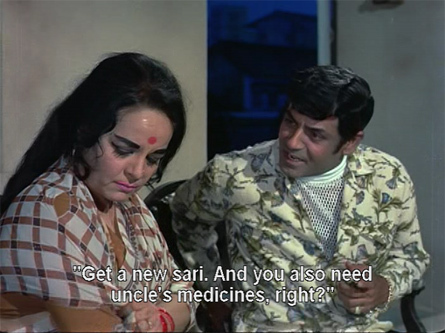 This was one of the last few movies of Nanda as a heroine before she bade good bye to movies. I don’t know if this is true but several sites state that Nazima died at the young age of 27 in 1975. Her last film was Ranga Khush with Joginder. If movies were medicines – Adhikaar will be a strong contender for ambien, no it would be shoe in for a combination of halcyon and lunesta. This opinion was formed when I first saw the movie in 70s. 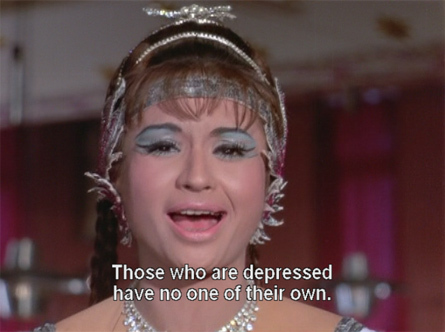 I took a decision at ripe old age of 10 or 12 that I will never watch another movie with nanda or deb mukherjee in it. Having said that, your review is perfect – including the bad decision and coincidence matrix. 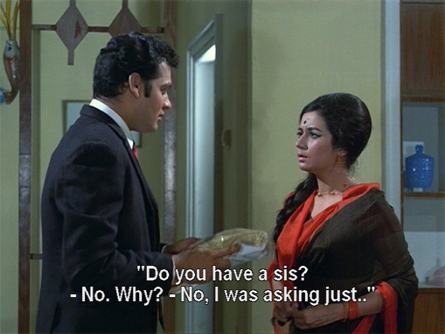 Incidentally joy mukherjee’s son was a classmate/friend in college, and a few mukherjee’s I met were all nut cases. Dear memsaab , i want to say i love your blog. 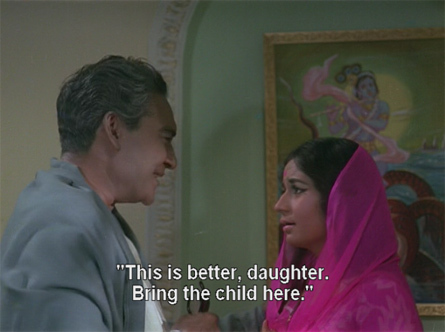 im 24 years old but for forced by my mom to watch old indian movies and now i loveeeee it. But i wished you would revieuw Ghar . cast: Rekha and Vinod Mehra aaaaaaamzing movie!! Thanks :) Have not seen Ghar, but maybe one of these days! This movie ADHIKAAR was somewehere around 1971/72,I do recall hearing it songs on radio,as DD had not begun its operations in Panjab those days,I had just begun my school innings those days,saw this movie on B/W DD days ,this one so many twists/turns that even today at age of fourty plus,Iam still unable to unstand the same,but it had fablous music which can heard even today by burmanda and bombastic NANDA aunty,it was surprise/shock and somewhat hurting to know that NAZIMA aunty passed away in1975 itself at age of twenty seven,though I do remember watching her last two movies in1975 and they a master piece classic by Joginder uncle”RANGA KHUSH july 1975,and SANYASI by MANOJ uncle oct1975 ,both were released after her surprise death,anyway sometings /destiny cannot be altered.RAVINDER MINHAS,Jalandhar city,Panjab,minhas35@yahoo.com.